Cabochon Antique Cushion Genuine Green Quartz in Grade AA This Grade AA Natural Green Quartz Gemstone displays a pretty light to medium-light bright green color with good brilliance and e cellent symmetry and make. The clarity grade is "Eye Clean". 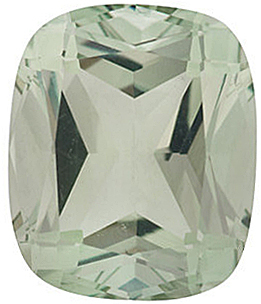 This Green Quartz Gemstone has been enhanced with radiation. All Green Quartz sold by AfricaGems is in compliance with the U.S.N.R.C. licensing regulations. 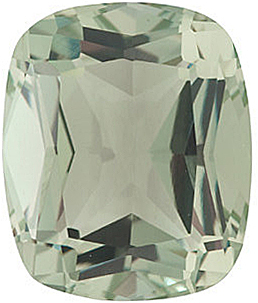 We Have the Largest Selection of Antique Cushion Cut Green Quartz Gemstones available anywhere. Not only is our selection the largest, our quality is above the rest! You will find our cutting standard of our loose gemstones and our quartz gemstones to be of the highest standards. Like our other Quartz gemstones, Smokey Quartz Gems and Lemon Quartz Gemstones we stock a full range of Green Quartz in a huge range of sizes and shapes all at the lowest possible prices that are ready for same day shipping. The USNRC (United States Nuclear Regulatory Commission) has strict import regulations regarding treated quartz gemstones to ensure that they do not have residual radiation from the treatment process. 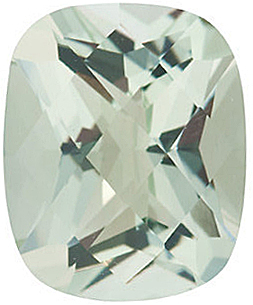 AfricaGems guarantees that all of our Green Quartz gemstones comply and are imported under these regulations.